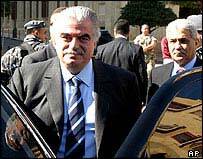 The unanimous Security Council vote demanding that Syria co-operate with the UN inquiry into the death of the former Lebanese Prime Minister Rafik Hariri has added another US-led diplomatic front in the Middle East. Three of the major countries in the region are now either in huge upheaval - such as Iraq - or in a dispute with international organisations - such as Syria with the Security Council over Mr Hariri's murder, and Iran with the International Atomic Energy Agency over its uranium enrichment work. The Middle East, therefore, is far from settling down into a zone of peace, stability and security. The resolution on Syria, 1636, was toned down by its Western sponsors, the US, France and Britain, in order to get a unanimous vote. The specific threat of sanctions was removed but "further action" is threatened if co-operation is not undertaken. The Council's vote on Syria tightens the squeeze on the government of President Bashar al-Assad. The inquiry has pointed the finger of suspicion at some of his closest associates. However, it holds back from actually imposing sanctions because that would need the approval of veto-wielding Russia, which is reluctant to take this extra step, at least for now. The United States is taking the diplomatic path with Syria - as it is with Iran, but as it did not, in the final analysis, with Iraq. The resolution on Syria was the product of close co-operation between the US and France, which were at loggerheads over Iraq. France has a historical interest in Lebanon and Syria, dating from the end of World War I when Britain and France carved up spheres of influence in the region. The US has therefore continued with the multilateral approach it has demonstrated over Iran. 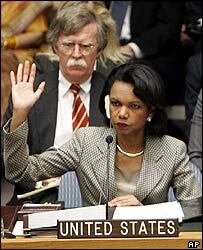 The Bush administration's view towards Syria appears to match that towards Libya. It is not looking for regime change as much as policy or behaviour change. The US Secretary of State, Condoleezza Rice, said in her statement after the vote that Syria "needs to make a strategic decision to fundamentally change its behaviour." Libya publicly gave up its secret nuclear programme, and Colonel Gaddafi suddenly became persona grata as far as Washington was concerned. President Assad will find it harder to assuage UN and US demands to give up for questioning some of his closest associates. If he does not then, regardless of what the UN does, the US will take a firmer line, though military action as in Iraq is highly unlikely. The fact is that the US is fully stretched in Iraq, and Syria does not present the same kind of scenario for an invasion. The current US approach does not mean that it would not welcome regime change in Syria. However, given the explosion of Islamist violence in Iraq, it would also be wary of encouraging a change which could turn revolutionary.